According to Dan and Sue Harvey, long time residents of Epping, this area was operated during the late 30's. It was developed by Evelyn "Ma" Brown and Barbara Newman of the University of NH, Physical Education Dept. as a training slope for the UNH ski team. They would load the team into a bus and drive out in the afternoons to practice. The area was also open to the public. The rope tow was powered by a Model A truck motor (what else?) The war effectively put an end to this area. 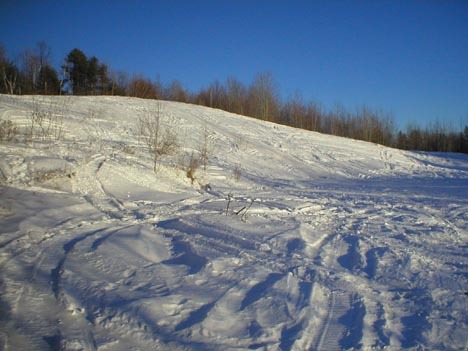 The slope, known locally as Brown's Hill, is still clear today and is used as a sledding hill and snowmobile run. It sits just east of the intersection of Calef Highway, NH Rt. 125 and Hedding Rd. It is visible from Rt. 125 just beyond the DMV/State Police barracks. To find it go north on Rt. 125 from Rt.101 to the lights at Hedding Rd. Go right and take the third right at the top of the rise. This is the second/upper entrance to the trailer park. Follow this to the foot of the slope.